"The Demand of the Women of South Africa for the Withdrawal of Passes for Women and the Repeal of the Pass Laws,"
We, the women of South Africa, have come here today. We represent and we speak on behalf of hundreds of thousands of women who could not be with us. But all over the country, at this moment, women are watching and thinking of us. Their hearts are with us. We are women from every part of South Africa. We are women of every race, we come from the cities and the towns, from the reserves and the villages. We come as women united in our purpose to save the African women from the degradation of passes. For hundreds of years the African people have suffered under the most bitter law of all - the pass law which has brought untold suffering to every African family. Raids, arrests, loss of pay, long hours at the pass office, weeks in the cells awaiting trial, forced farm labour - this is what the pass laws have brought to African men. Punishment and misery - not for a crime, but for the lack of a pass. We African women know too well the effect of this law upon our homes, our children. We, who are not African women, know how our sisters suffer. Your Government proclaims aloud at home and abroad that the pass laws have been abolished, but we women know this is not true, for our husbands, our brothers? our sons are still being arrested, thousands every day, under these very pass laws. It is only the name that has changed. The ’’reference book" and the pass are one. In March 1952, your Minister of Native Affairs denied in Parliament that a law would be introduced which would force African women to carry passes. 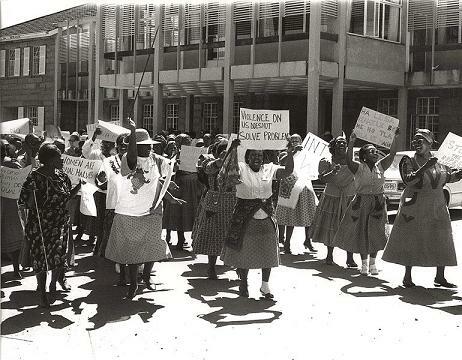 But in 1956 your Government is attempting to force passes upon the African women, and we are here today to protest against this insult to all women. For to us an insult to African women is an insult to all women. That women will lose their right to move freely from one place to another. In the name of women of South Africa, we say to you, each one of us, African, European, Indian, Coloured, that we are opposed to the pass system. We voters and voteless, call upon your Government not to issue passes to African women. 1. In 1955 the then Minister of Native Affairs stated "African women will be issued with passes as from January 1956". The law had been amended in 1950 to enable the government to introduce passes for women. Up until then only African men had been obliged to carry passes. A women’s anti-pass movement immediately began to grow. The first big protest against the pass laws took place in October 1955. Protests grew all over the country and culminated in a mass demonstration at the Union Buildings, Pretoria, on 9 August 1956 - the day that has since be designated as "Women’s Day" in South Africa. Hundreds of thousands of signatures on petition forms such as the above were deposited at the office of the Prime Minister who, of course, was not available to receive them.